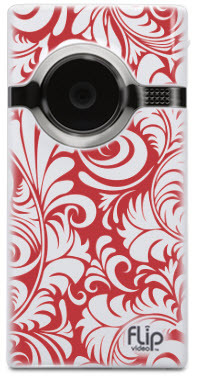 OK, so this isn’t strictly about interior design per se, but how cute is this – the Mino Flip Videocam, available in an unlimited number of skin patterns! I am going to be quite unable to resist buying one of these things in the pattern shown, especially because I’m a complete sucker for anything red. 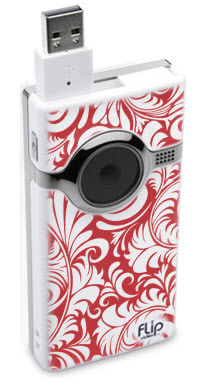 Offered in two models, at an incredibly reasonable price, and able to record up to 4 hours of video on a single charge with the larger model, this compact little camcorder that will plug directly into a USB port to upload your video to your computer or directly to email ought to fulfill almost anyone’s recording needs, at a price that can’t be beat. If you can’t find one of their own skin designs from among the literally hundreds they offer that suits your fancy, including other wallpaper-like designs, you can either upload your own image or design your own pattern from scratch – so you can literally match it to your own wallpaper, if you want – or anything else. The customization options boggle the mind. Talk about a great way to personalize a gift, or put your company logo on gear used in-house so it will more likely find its way home if you misplace it somewhere, or to just have a whole lot of fun, and be sure that your camcorder will never be mistaken by anyone else for their own. 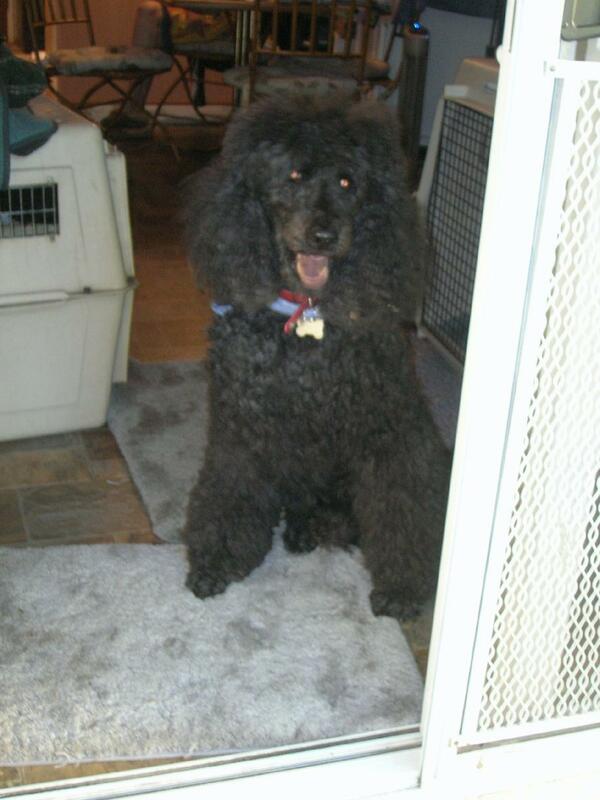 Fennel (RB) at "summer camp" - where I used to board him when I traveled. died last fall, and I’m still hunting for my next puppy, so I’ve been completely petless for a little while now – for the first time in 18 years. It’s really weird. Although I live about half time with Cricket and her daddy, it’s really not the same as having one of my own, in my own home all the time. So, while I really miss my guy, I’m really enjoying having Cricket here, and as I deal with the fur and litter box, I’m reminded of all of the fun – and the hassles – of pet ownership – including the implications for interior design. Anyone who has ever had a pet knows that they pose a challenge to having and maintaining a beautiful home, even when they’re very well trained. Accidents and messes are just a part of life with an animal in the house, which includes vomiting, tracking dirt in, and anything from occasional incontinence to outright bad behavior making them soil anywhere they want, as well as other issues such as cats scratching the furniture, climbing the drapes, etc. 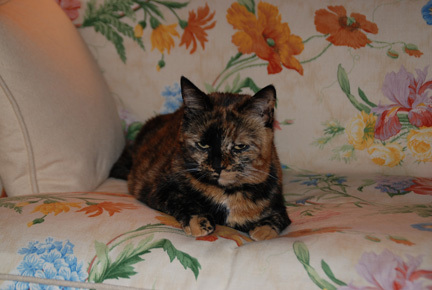 The soiling issues also get worse as the pet ages, or if it develops health problems. People often ask me how they can still have a nice home when they share it with pets, so here are some thoughts. No matter what materials you choose for your home, your first line of defense is obviously to make sure that Fido or Garfield are well-trained so that they do their business where they are supposed to, and use scratching posts, climbing towers designed for the purpose, and their own chewtoys instead of the furniture and drapes to exercise their natural instincts to chew, climb, and scratch. Keeping the critters off of the furniture altogether will help preserve it, but for most people these days, that’s not an option, and you still have to deal with the floors anyways. Regular bathing and grooming of your pet will also keep it clean and prevent shedding, which will help immensely with maintaining the cleanliness of your home. What do you do if you want the look of a lot of books (or space for actual books), but your space is too small to install bookcases? Do faux books look real enough if you don’t have enough of the real thing? How can you make the most of the space you’ve got? A question from a reader on an Amazon.com discussion forum about faux books got me thinking about these things the other day. No, most faux books don’t look even remotely real. Because neither they nor the “shelves” they are on are real, they lack depth and characteristics such as shadows that would show in actual bookshelves with real books. They can be fun on things like cabinet doors or utility room doors to conceal them, but the moment someone goes to pull one off the shelf to look at it, they will immediately see what’s up for sure, and your hoped-for erudite image will be blown, so these things are not a great choice for other spaces, especially offices or libraries, where one would expect to find real books. but you could also make your own collage using photos of books that you take yourself or find elsewhere – or actual pages of books, magazines, or newspapers – and create a highly-personalized, one-of-a-kind design, which will save even more money, plus be unique, as in the chic bedroom image below. You could use images of books on shelves and try to make it as realistic-looking as possible, or tile and overlay the space with images of book covers, or get creative and play with angles and overlaps and adding in other elements as well, just for fun. Newsworthy wallpaper via FabGreen.com. Source unknown; if this is your image, let me know, and I'll provide attribution. The best way to have the look of books, of course, is to have real ones – and naturally, finding enough space in a small room if you do have a lot of them can be quite a challenge, so what’s a bibliophile to do? Bookshelves don’t have to sit on the floor, and you can get a lot of mileage out of putting them on the wall, and virtually double your usable space. Hanging shelves over a desk or sofa, above and surrounding doorways and windows, and even completely encircling the room near the ceiling level with one or two shelves can add a lot of extra storage space without taking up any precious floor space at all. Use smaller furniture, too, and less of it, and you’ll be able to fit everything in. You can even store them in the rafters, if your ceiling is open. Try narrow bookcases (maybe with pull-out shelves) on either side of a chair or sofa instead of or behind your end tables. Match these up with the shelves above the sofa and you’ll create a custom niche for the furniture but use very minimal floor space. · Use built-ins or systems furniture (even Elfa shelving, if you can’t afford custom cabinetry or ready-mades) instead of free-standing furniture to maximize the use of space, and integrate cabinetry wall-to-wall and floor-to-ceiling. Even a tiny 10’x10’ room can hold a complete library and all possible office equipment this way; I’m working in a space just like this as I write. · Is there a closet in the room? Add at least one more shelf above the rod, or, if you can spare the space, fill the closet entirely with shelves. Or hang a closet organizer designed for holding clothing or purses and fill it with paperbacks instead. 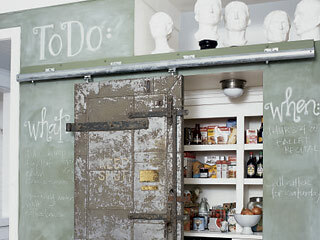 The clever pantry shown below could just as easily house books or anything else you might want to store and/or display. attribution unknown - If this is your image, let me know, and I'll add your name. · Look between the studs. Yes, remove the drywall and build it out a few inches, installing shelves between the studs, refinish it, and voila! – a whole bookcase anywhere you want one that only protrudes a few inches tops into the existing floor space of the room. Or replace the whole wall with a bookcase – maybe backed by a translucent plastic to let light in from (or lend it to) the next room over. · Store some inside a multifunction piece of furniture, such as a storage ottoman. 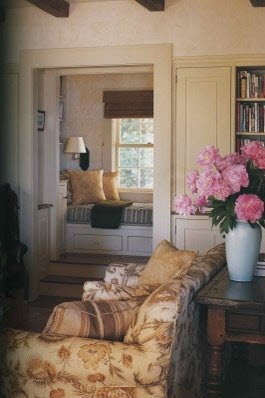 · Build a window seat with shelves or a drawer in the base and/or side walls of the nook it’s in. Where drawers are shown in the images below, you could just as easily use open cubbies as bookshelves instead. If you’ve got as little as 6″ space behind a door when it’s open, with the addition of a large hinge, you can build a bookcase onto the back of the door. Or put the shelving on the front of the door. If you have the space, you can even do this on a bi-fold closet door, or a rotating door. Line up or pile books underneath your desk, occasional tables, or even the sofa, if you’ve got one that sits on relatively high legs and has no skirt. You can even put some shelves underneath the desk. Pile books artfully around the room on top of tables, desks, windowsills, and on the floor, and display your decorative objets sitting on top of the books. And finally, if your obsession becomes too great, do as Sharon Stanley Ruggiero confessed to resorting to at http://www.cotedetexas.blogspot.com/2008/08/living-with-books-lots-of-them.html in Joni’s fabulous post on living with masses of books, and place them between the spindles of the banister on your stairway. Forego one or more end tables and coffee tables altogether, and just use stacks of books. This can either be a permanent solution, or used just until you can afford (or locate) the perfect furniture piece. By themselves or mixed with other items, books are great decorative objects. 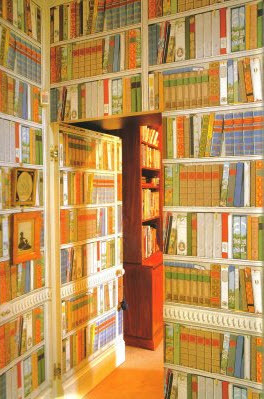 You don’t have to fit all of your books in one room; where else in your house can you place some? Even the bathroom, kitchen, and hallways are fair game for creative book storage. Yes, it’s anathema to a book-lover, but eventually, almost all of us have to prune our book collections to some extent, so take a good, hard look at how many, and which, books are most essential to you, and find new homes for as many of the others as you need to, when the time comes. – Please pardon any formatting errors or oddities; I’m still learning how to use this software and deal with the graphics. – For any images without attribution, if you know the photographer and/or designer, or it’s your image, please let me know and I’ll update it with your tag line. Live In a Small Apartment or House? You Need These 33 Clever Things! AL – Urgent: Protect Your Right to Practice in Alabama!